Electronic Arts must have been pleased as hell to read, in the Los Angeles Times, that front-office types are using NBA Live 09 to help in making some of their decisions. The NBA says about half of the league's 30 teams employ the video game in making personnel evaluations. The game's "Dynamic DNA", the new stats engine behind this kind of analysis, is good enough to be taken seriously even when team officials are evaluating straight-up rookies barely a dozen games into the season. 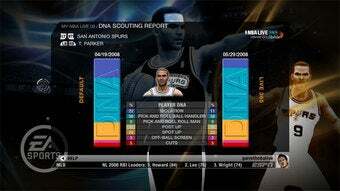 Dynamic DNA not only simulates the surges and slumps players hit during a long 82-game season, it updates that model with real-world statistics and outcomes fed into EA's servers daily. "For example, you can tell how often, if [Kevin] Love throws an outlet pass, how often his team scores on the possession. You can tell how often [O.J.] Mayo goes right versus left, how effective the team is with Mayo pulling up and shooting versus when he pulls up and passes instead." Furthermore, writes the Times: "In the quiet of his office, Morey said he can see how often a player posts up and gets shots on cuts to the basket as well as about defensive and offensive tendencies." Morey is a devotee of talent-evaluation demigod Billy Beane (the general manager of Major League Baseball's Oakland Athletics), and swears by video games — and not as a diversion. "I don't play EA Sports as a game. I use it as a tool," he says. Of course, EA is a marketing partner of the NBA, so take the name brand mention for what it's worth. But general managers of major sports franchises don't have much time to screw around mid-season, so I'd believe him if he says it helps.